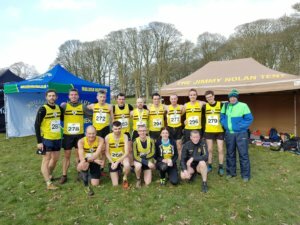 While the current mid-week weather may disagree, the weekend fixtures signalled the end of Winter, as the cross country season was brought to a close in Lurgan Park. NBH runners also headed to the familiar shores of Castlewellan Lake and even as far afield as Andalucía. On Saturday hundreds of runners headed to the spacious grounds of Lurgan Park to tackle the Senior XC Championship race. Faced with an intimidating race of 6km for the women and 12km for the men, the runners were also met with chilly winds and generally cold conditions. 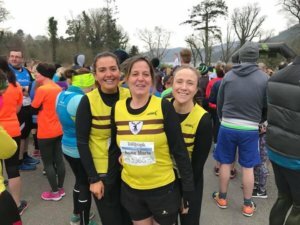 While not all bad, the conditions also presented some firm ground underfoot, a welcome sight for the large contingent of NBH runners who had spent the winter traipsing through the muck and sludge of various courses across Ulster. Coupled with a large presence of encouraging spectators it had all the makings of a great race. First up was the ladies race, which saw North Down AC’s Jessica Craig lead from the off, only to be chased and raced hard by Rebekah Nixon from Dromore AC and her club mate Rachel Gibson. Rebekah took the win in the end (24:21). In the team competition it was North Down AC who won comfortably with 4 runners in the top 10. NBH had some great performances by the ladies of the club, with many building on the hard training and XC racing they’ve been doing throughout the entire Winter, with some well deserved results. In the overall team competition NBH ladies took 22nd place out the 32 teams competing. The Mens race followed, with NBH own Mark McKinstry running at the head of the race throughout, along with Declan Reed (City of Derry Spartans) and Neil Johnston (Springwell Running Club). Mark showed his good form and strength to control the race at the front over most of the 12 km, only in the final stages was Declan Reed able to move past and take the win (41:40), with Mark taking a fantastic, but no doubt bittersweet, second place. Throughout the wider field, the NBH men were well placed with many fighting battles on the course and marking the colours of the clubs to compete with. The culmination of all of these efforts races over the draining 12km secured the club 2nd place overall in the team event, with 6 shiny silver medals going home in NBH kitbags. Possibly an even more impressive insight to the club performance on Saturday was the strength in numbers; of the 22 teams at the NI & Ulster event there were 3 NBH teams, finishing in 2nd, 6th and 20th position. A great exhibition of club running. Overall City of Derry secured gold in the team event with their 6 men all finishing within the top 12. Great to see such successes on a bright sunny day, after months of tough, dark, damp Winters training. With the completion of the final race in the XC season the league was also brought to an end. This league proved, as ever, to be a close run competition over the course of five months and eight races. 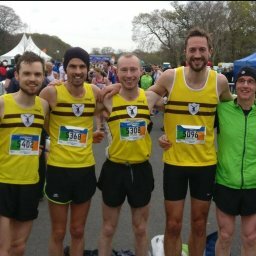 In the men’s league NBH secured second position only 6 points behind Foyle Valley AC, the league winners. In the ladies competition the NBH women took 11th position out of the 26 teams, after some great turnouts throughout the season. The ladies league was won by North Down AC. No doubt after a seasons training and racing over the muck and hills, the NBH men and women will be well strengthened, fit and ready to tear up the tarmac in the Spring and Summer racing seasons. Also on Saturday a large crowd turned out at Castlewellan for the finale of the popular Belfast Telegraph Run Forest Run Series, organised by Born 2 Run. The course was loops around the Castlewellan Lake, and the challenging foothills that surround the lake. The club had representation in both the 5km and 10km events, with Rosy Ryan participating in the 5km event. At the head of the 10km race NBH had two runners in the mix, with Gladys Ganiel securing yet another first in the ladies’ race (37:48). The men’s event was won by Vincent McKenna of Queens University AC (35:11) with NBH Davy Clarke taking a fantastic 3rd place. On Saturday thousands of runners participated in the 34th Maratón de Sevilla, in southern Spain. In a light breeze with a cool 10 degrees Celsius the leaders Dickson Tuwei of Kenya and Morocco’s Kaoutar Boulaid finished in 2:08:18 and 2:25:32 respectively, with Boulaid breaking the women’s course record by more than half a minute. 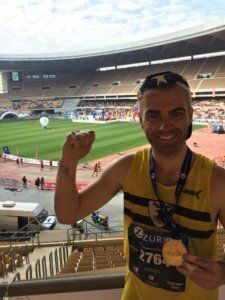 NBH own Ray Cameron had put in the hard winter months of mileage to build towards this event and was well rewarded with a fantastic 4 minute PB, as he covered the marathon distance in a time of 3:14:07. As ever the NBH attended parkrun events in their droves. Well done all!